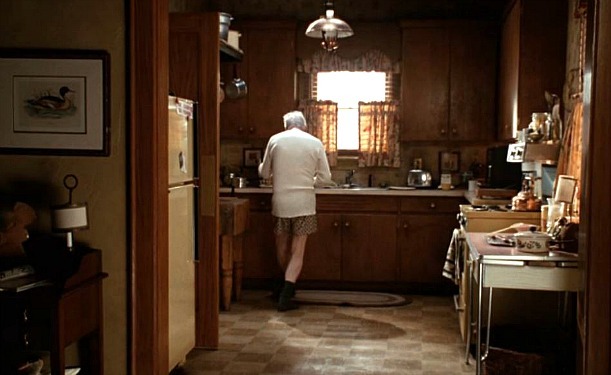 Remember Jack Lemmon’s little white bungalow in the early ’90s comedy Grumpy Old Men? 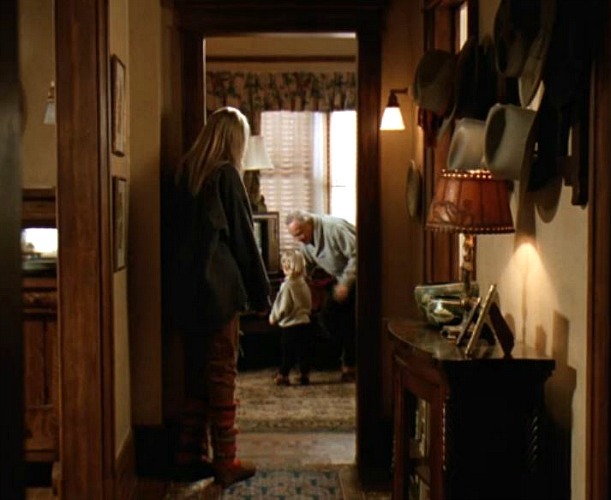 They filmed the exteriors in a St. Paul, Minnesota, neighborhood, and the house recently went on the market for $195,000. 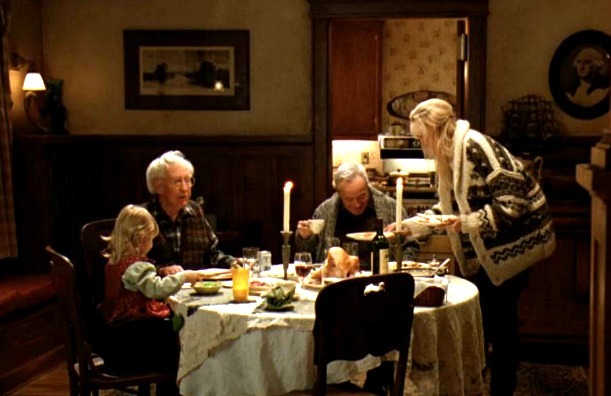 Let’s take a look at the house as it was in the movie and compare it to the real thing today! The interiors were sets at Paisley Park Studios in Minnesota, but they sure looked real. They gave it lots of dark old woodwork for a Craftsman bungalow look inside. John and Max are elderly men living next door to each other. They’re continuously arguing and insulting each other, and have been this way for over 50 years. One day, Ariel, moves into the street. Both men are attracted to her, and their rivalry steps up a gear. The woodwork in the house is beautiful. 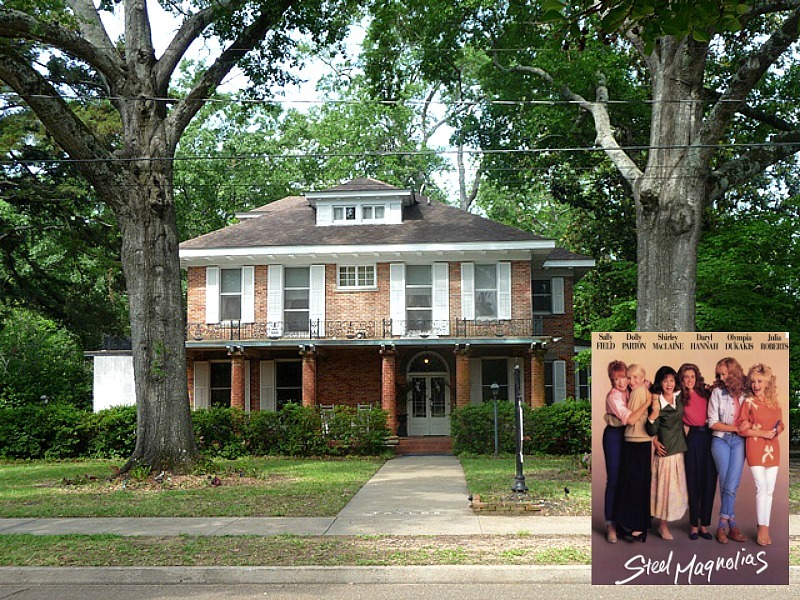 The production designer was David Chapman, who also worked on Steel Magnolias. 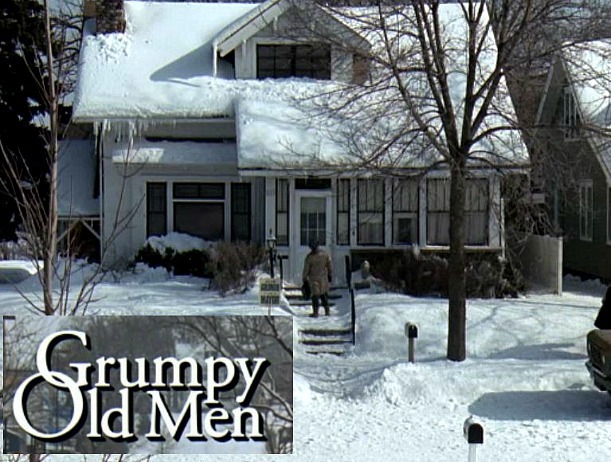 There was a sequel in 1995, Grumpier Old Men, that was also filmed in this neighborhood. It was built in 1914 and has about 1,400 square feet. The listing says there’s a view of Lake Phalen from the back of the house. The bungalow has 2 bedrooms and 1 bath. 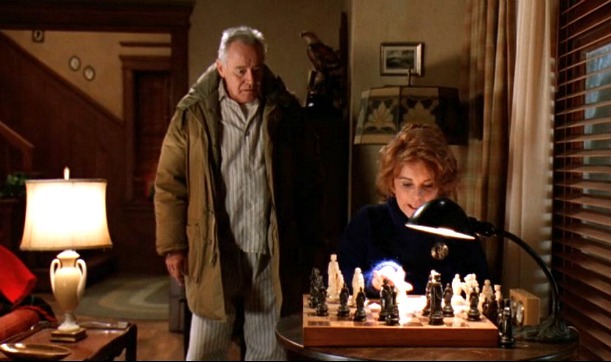 this movie was the 6th time they appeared together in a film. Matthau was hospitalized with double pneumonia. Historic and iconic Phalen Heights century home used in the filming of Grumpy and Grumpier Old Men. This Hilltop Colonial sits above the rest of the neighborhood on a 1/3 acre corner lot with views of Lake Phalen. Old world charm, close to 1500 finished square feet and 3 bedrooms on one level are just a few of this home’s incredible features. 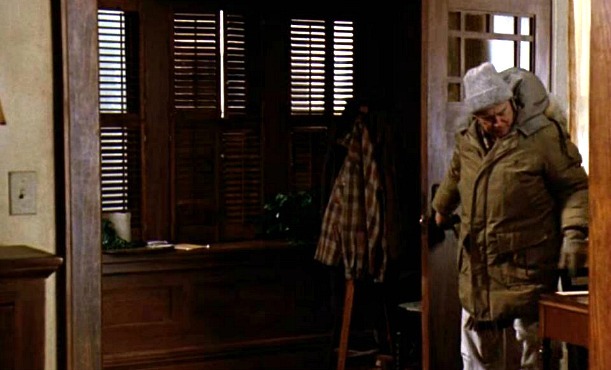 There’s a plaque on the door commemorating its appearance in Grumpier Old Men. The woodwork in “Ariel’s House” is pretty fabulous, too. So much potential in houses like this! 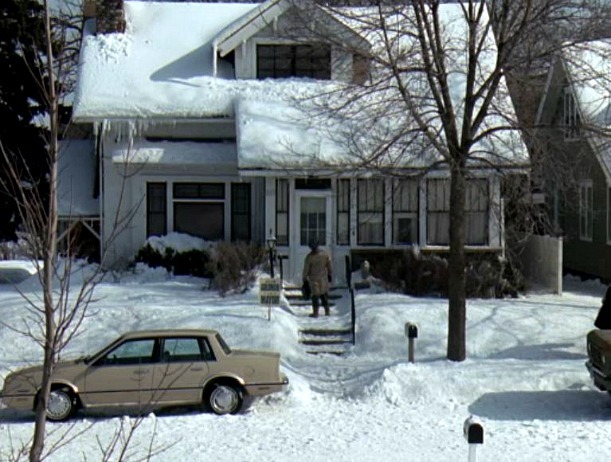 You can read more about Jack Lemmon’s house from “Grumpy Old Men” in an article at Twin Cities, a fun post at I Am Not a Stalker, and the listing. I love bungalows. We lived in one when we were first married, brings back memories. Thanks for the tour Julia. This house is full of charming details. Thank you so much for sharing this with us!!! Wishing a very blessed week! Great house, but the interiors look a bit too updated and “sleek” for my tastes. Part of the appeal of those older homes is that they have their own unique flair. Love this house! The porch is fantastic and the kitchen is so cute. The real interior of this house (before the woodwork was painted) probably looked a fair bit like the studio version, which makes me wonder why they didn’t just use the real interior. This building of studio interiors seems very common in Hollywood. I suppose the real interiors aren’t large enough to accommodate the crew, cameras etc. This was on the news in Minnesota when it went on the market. I love the interior and if it had a second bath, it would be perfect. My friends and I were joking that we should go in together and buy it as a shared second home. It’s a great neighborhood. What a nice bungalow. I love it except for I wish the staircase looked like the one from the movie. 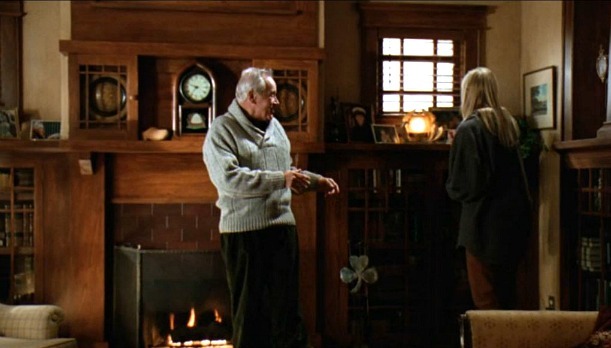 That’s ok, this house is charming and I like the interior better than the sets. What a lovely house. I’m still in shock from falling in love with that sunporch. Love. Sappy, old fashioned love. I can never get enough of old craftsman homes like this. I think the reason I loved the movie so much besides all the great actors that were in it was the craftsman style homes in the film. My bet is that home will have multiple offers and be snapped up in a minute. 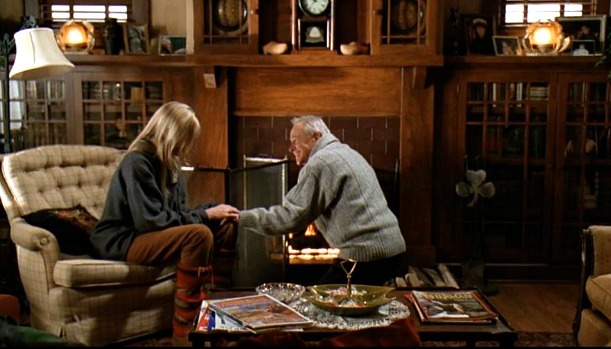 I love the fireplace wall in John’s house too–the movie version.I love old craftsman homes like this too and can never get enough of them, although I tend to lean towards being more of a purist when it comes to whether or not to paint the woodwork. On the other hand I can also understand wanting to paint the woodwork white too, especially if one lives where the weather tends to be gloomy. As for the inside of the home (the listing) I don’t tend to be drawn to gray and am feeling a bit over-dosed seeing so much of it these days. I know that it’s still currently all the rage, but I just can’t seem to hop on board, although I don’t mind gray/green. What I do love is the old stove in the kitchen and the living room window and the paint color in the bedroom. These homes are always so full of charm.